PubNub (http://pubnub.com) is a real time messaging service that allows users to post JSON Messages and subscribe to a stream of these messages. The PubNub Notification Target allows for device messages to be forwarded to one of these streams. Messages will be forwarded in JSON format (See Default Data Fields). From the PubNub dashboard create a new App and a new Keyset. The Publish Key is the key that identifies the stream, the Subscriber Key is the key that identifies the subscribable stream. The Channel is the subscriber channel that the messages will appear on and Client UUID is the client id, this will identify the user in a stream. The PAM Authentication (Optional) field is used when PAM authentication is required on the stream. Click on debug console and create a Client. 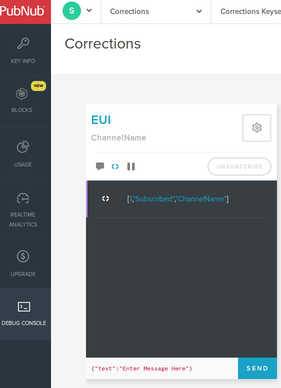 Here you will make your Client UUID and Channel Name(this goes into subcriber channel) in the notifier. Specify the Publish Key, Cluent UUID, Subscriber Key, and Subscriber Channel into the provided Notification Target fields. The PAM Authentication field is optional and only necessary if the stream has been configured for authentication.